Dar Al Arkan, the largest listed real estate developer in Saudi Arabia, said it has signed an agreement with Majid Al Futtaim, a leading shopping mall, communities, retail and leisure pioneer in the region, to open VOX Cinemas multiplex in the kingdom. As per the deal, VOX Cinemas will operate the new 15-screen multiplex at Dar Al Arkan's Al Qasr Mall in the Saudi capital. VOX Cinemas, a unit of Majid Al Futtaim, is the Middle East's most innovative and customer-focused cinema exhibitor, said a statement from the Dubai group. With 35 cinema complexes totaling 345 screens across the region, including 187 screens in the UAE, 15 screens in Lebanon, 47 screens in Oman, 30 screens in Bahrain, 28 screens in Egypt, 17 screens in Kuwait, and 4 screens in Saudi Arabia, VOX Cinemas is now the Middle East's largest and fastest growing cinema exhibitor. The deal was officially signed in capital Riyadh and works have started immediately, said the statement from Dar Al Arkan. The multiplex is scheduled to open in the first quarter of 2019 and will include VOX Cinemas' signature KIDS and MAX experiences. KIDS is a family-friendly movie environment designed for little movie fans, and MAX is the mega-screen made for big blockbuster viewing, said the statement from Majid Al Futtaim. The design involves a major retail transformation of an existing section of the mall for the brand-new 15-screen multiplex, which will offer a superior leisure experience to the mall visitors. The addition of more outlets for casual dining and entertainment, including indoor bowling will enhance the visitors' experience at the mall, it stated. On the new tieup, Yousef Bin Abdullah Al Shelash, the chairman of Dar Al Arkan Development, said: "Majid Al Futtaim is a perfect partner that will help us create a unique experience at Al Qasr Mall for Riyadh residents and visitors." "The company is considered the largest cinema operator in the region. It offers the most innovative and customer focused cinema experience, including the latest cinematic technology and a range of different cinema concepts to suit different consumer expectations. Al Qasr Mall is an ideal site for this new feature in family entertainment and is expected to become a celebrated addition to our existing and diverse selection of outlets that offer something for everyone," stated Al Shelash. "These are exciting times for Saudi Arabia and we are delighted to be playing a small but significant part towards achieving the Kingdom's Vision 2030, which aims to build an entire ecosystem for arts, tourism and entertainment," he added. Dar Al Arkan's contemporary four-storey building, Al Qasr Mall hosts regional and international high-street favourites, diverse dining experiences providing myriad options in food and beverage outlets, a food court for quick bites, indoor fun zone for children and Carrefour Hypermarket to shop home-essentials. Dar Al Arkan Development CEO Kelvin Kwok Han Sim said: "The new cinema complex will meet the expectations of our discerning guests and will feature the next generation technology fit for the current sophisticated and tech-savvy Saudi movie-buffs. This is a significant contribution and a novel addition to the evolving Saudi-cinema-culture. We are delighted to be partnering with Majid Al Futtaim on this exciting project in Riyadh." Majid Al Futtaim Cinemas CEO Cameron Mitchell expressed delight at partnering with Dar Al Arkan on this exciting project. "This is a significant opportunity for us to play an active role in contributing to Saudi Arabia's 2030 vision which places culture and entertainment at the heart of a quality of life for Saudi citizens and residents," he stated. 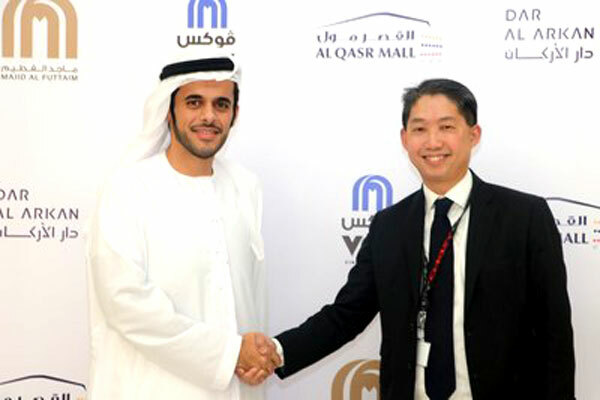 Mohamed Galal, Chief Executive Officer of Dar Al Arkan Assets Management, the company's retail and leasing division, concluded: "We are thrilled to be introducing the new entertainment complex at Al Qasr Mall, which will bring family entertainment and blockbuster movies to the doorsteps of film fans here in Riyadh."